In case you haven’t noticed, the newly-rebooted Hellboy series is not going over so well with people. As of this review, it sits at an alarmingly low 15% on Rotten Tomatoes, with the majority of critics already lining up to call it one of the worst movies of the year, and if early box office numbers are anything to go by, it’s set to bomb pretty hard on its opening weekend; seriously, when more people are flocking to see not one but TWO family-friendly body-swap movies instead of a movie with a big red demon as its lead, you know you’ve seriously messed up. As easy as it would be, though, to immediately write this movie off as a total failure – and it is extremely easy, since the movie is really not very good at all – I wouldn’t necessarily go after the people put in charge of making it. This feels like a film that was hacked to pieces by a studio that had absolutely no idea what they were doing, and what we’re left with is a giant mess of a movie that is covered with the grubby fingerprints of its numerous producers (eight, to be precise, and that’s not even including the amount of executive producers that are also credited). The plot – or at least, what we can piece together from its haphazard approach – sees the titular beast (David Harbour), who for those unfamiliar with the character is a red demon raised by humanity and who works as an agent for the Bureau for Paranormal Research and Defense, be assigned to stop an undead medieval witch (Milla Jovovich) from returning and causing death and destruction upon the world. Along the way, he teams up with a young woman named Alice (Sasha Lane) who can communicate with ghosts, scarred Japanese-American soldier Ben Daimio (Daniel Dae Kim), and his adoptive father and head of the BPRD Trevor Bruttenholm (Ian McShane) to take on the evil witch before she blah, blah, blah end of the world and blah, blah, blah evil movie villain stuff. As thin as the plot is, it feels even more incomprehensible thanks to the sheer randomness of the editing, almost as though it’s made up entirely of shortened sequences that were heavily trimmed down and ordered by the producers to be inserted wherever they could be, even if it makes very little sense within the context of the story. Some scenes will just end before characters even get to finish their lines of dialogue, and others will suddenly cut back and forth to moments that presumably happen a considerable amount of time after the initial scene takes place; it’s incredibly all over the place, without much focus or a sense of fun, because it’s mostly bogged down by dull exposition when really, all we want to see is some enjoyable action spliced with some fantasy. However, even when said action arrives, it comes with an excessive amount of gore and violence that more often than not feels very unnecessary, which can sometimes work when you have a more adult rating that gives you freer rein to show more blood and guts as well as use some choice examples of profanity, but here it’s like they were given the keys to a fancy car but they have no idea how to drive it; the gore is extremely over-the-top as well as overdone, kind of like they’re compensating for having a weak script filled with questionable dialogue and nonsensical character motivations by randomly having blood gush like a waterfall and having the lead throw out an F-bomb every once in a while. It kind of says everything when the very first shot of the film is of a crow plucking out an eyeball from the socket of a corpse; it doesn’t get much prettier from there. It’s an utter train-wreck of a final product, but again I don’t necessarily know how much blame should be placed on the filmmakers themselves. Director Neil Marshall, who is known for some particularly bloody horror movies like Dog Soldiers and The Descent, as well as a couple of standout episodes of Game of Thrones, is a competent director who has proven in the past to be more than able to handle a mixture of gory horror and dark comedy, but if recent reports about the film’s behind-the-scenes drama are to be believed then it seems none of the producers at Lionsgate had enough faith in the guy to just let him make the movie he signed on to do. The same applies for David Harbour, who is also pretty damn good at what he does, and to his credit ends up being the best part of the whole movie due to his ability to make the character, previously iconised by Ron Perlman in Guillermo del Toro’s renditions of the character, very much his own. But just bringing up the fact that a filmmaker as sophisticated and creative as Guillermo del Toro had previously been involved with this particular property just makes this version all the more lacking in comparison; I wasn’t even a huge fan of the first Hellboy movie he did (I’m one of the few that preferred the second one, The Golden Army), but watching how soulless and heartless this movie is, it almost makes me want to go back and see that first film again, just because I remember it having a lot more humanity and passion to it, as well as characters I actually cared about and wanted to see go on more adventures. Regardless, even though the film is a massive miscalculation on all fronts, and even without the incessant studio tampering it still probably wouldn’t come close to touching del Toro’s original vision, I would be interested to see a director’s cut of this movie, if only to confirm whether or not the version we did get, which again seems to be pleasing absolutely nobody right now, is an absolute demon. 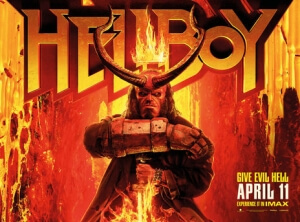 Hellboy is a soulless and thoroughly miscalculated attempt to reboot the popular comic-book character which stinks of studio interference left and right, despite director Neil Marshall and star David Harbour’s efforts to do the best that they can with a thin and incomprehensible script, which is filled with excessive violence and little to no heart.